If you thought Scythe was good, you need to race to the bookstore to pick up a copy of Thunderhead. In this fast paced sequel to the highly successful and popular young adult novel, Scythe, Citra Terranova is finding her feet as Scythe Anastasia, and Rowan Damisch has gone rogue, determined to destroy the corruption spreading through the Scythedom. And there is much corruption. A divide is growing amongst the scythes and they all must choose between the traditional and more honourable approach to gleaning (permanently ending lives to control the population) and a more liberal and boundary-stretching approach. Murder, assassination attempts and evil plots abound, and everything is connected, everything impacts on everything else. As the title suggests, Thunderhead has a strong focus on the AI computer (called the Thunderhead) that runs the world. The Thunderhead sees the evil spreading, but unable to interfere with anything or anyone connected to the Scythedom, it can do nothing but watch and weep for humanity. 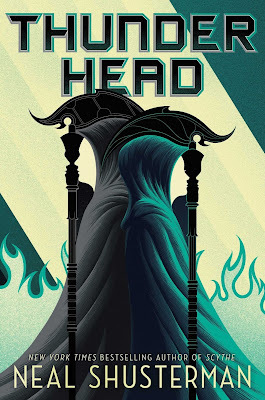 Shusterman is a master of multiple points of view and he has added even more to this novel, including the Thunderhead itself. Where Scythe was scattered with the journal entries of scythes, Thunderhead is scattered with the thoughts of the Thunderhead, giving insight into what the Thunderhead does on a daily basis, the challenges it faces to keep humanity thriving and what it really thinks about the Scythedom. I know I speak of the Thunderhead as if it is actually real, but this is what this book does to you. Each character is so well written — the story world is so well written — that it does feel real. You will end every chapter thinking about the implications and consequences of the choices the characters have made. And every time you read the thoughts of the Thunderhead, which appear between each chapter, you will feel for it and the challenges it faces. You will ask yourself what you would do if you were in its position. If you like the sound of Thunderhead, I do recommend checking out Scythe first as the sequel follows on directly from the first novel. But if you like science fiction, or know someone who does, this truely is a must-read series.